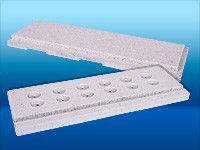 The use of Perlite can takes place for Kleinit plates, stones and moulded parts with individual, customised shapes. Use the possibilities offered by our professional team. We have been producing moulded parts since 1985. These are used by the electrical industry for switch housings and disconnector rings for example. Fire protection processes the material in fire protection doors, closing flaps and individual fire protection facilities, as well as in safe construction to improve the risk classification. Kleinit moulded parts are used a remaining core parts. Due to the natural character of Perlite, the material can be returned to the natural cycle without any concerns.